Objective: General surgery trainees perceptions regarding their own laparoscopic training remains poorly defined. The objective of this survey was to identify and evaluate learner experiences with laparoscopic procedures in general surgical programs on a national level. Methods: 284 residents were identified and contacted at English speaking general surgery programs across Canada. Each was asked to complete a web or paper based survey regarding their demographics, experiences with basic and advanced MIS procedures, and perceived barriers to training. Results: 239 of 284 (84%) surveyed residents responded. 87% of residents had access to a skills lab that taught MIS techniques, however standardized MIS curricula were implemented only 53% of the time. 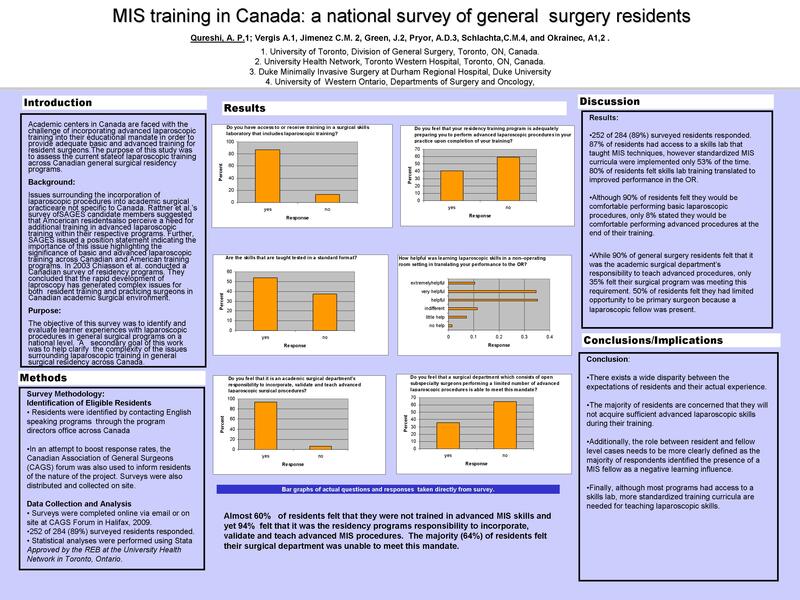 80% of residents felt skills lab training translated to improved performance in the OR. Although 90% of residents felt they would be comfortable performing basic laparoscopic procedures, only 8% stated they would be comfortable performing advanced procedures at the end of their training. While 90% of general surgery residents felt that it was the academic surgical departments responsibility to teach advanced procedures, only 35% felt their surgical program was meeting this requirement. 50% of residents felt they had limited opportunity to be primary surgeon because an MIS fellow was present. Conclusion: There exists a wide disparity between the expectations of residents and their actual experience. The majority of residents are concerned that they will not acquire sufficient laparoscopic skills during their training to perform advanced cases in practice. Additionally, the role between resident and fellow level cases needs to be more clearly defined as the majority of respondents identified the presence of a MIS fellow as a negative learning influence. Finally, although most centers had a surgical skills lab, the perception of most respondents that standardized curricula are not available should be addressed.